This vehicle has transferred from Riverside Depot to Percy Main, in a float/reserve capacity. 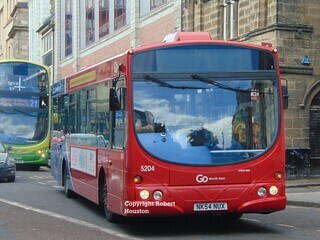 Alongside Scania L94UB/Wright Solar 5201 (NK54 NUU) and 5215 (NK54 NVL), this vehicle should be allocated to a Nexus Miscellaneous Works contract board, releasing a fleet livery Scania CN230UB/Scania Omnicity to operate one of three early-return boards on the "Coaster" 1 and "Cobalt Clipper" 309/310 services. 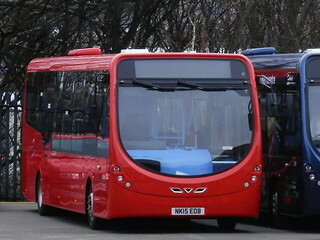 These temporary allocations are as a result of the "Cobalt Clipper" branded Wright Eclipse Gemini 2 bodied Volvo B9TLs undergoing repaint and internal refurbishment at Bus & Coach World, Blackburn. 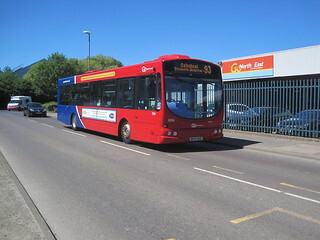 Following the entry into service of the ex-London Wright Eclipse Gemini bodied Volvo B7s on the new Miscellaneous Workings contracts being operated at Riverside; this vehicle is now in a float/reserve capacity, though presently remains allocated to Riverside. 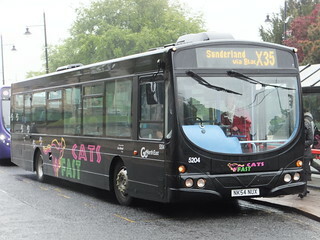 Following the entry into service of Optare Solo SR M900/Optare 719 (YJ62 FME) at Peterlee, this vehicl ehas transferred from Peterlee Depot to Riverside. 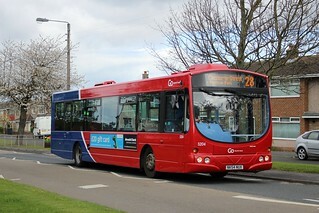 At Riverside, this vehicle serves as a replacement bus for Mercedes Citaro 0530N/Mercedes Citaro 5319 (NK08 MZW), which was withdrawn from service having sustained fire damage earlier in the year. Replaced in the fleet at Chester-le-Street Depot following Scania L94UB/Wright Solar 4958 (NL52 WVO) and 4960 (NL52 WVR) returning to full service at Chester-le-Street following the award of new Nexus contracts, this vehicle has transferred to Deptford Depot. 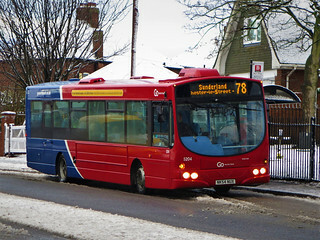 It is planned for the vehicle to transfer onward to Peterlee, where this vehicle will see temporary allocation to "Wear Xpress" services X6/X7, with the displaced Optare Solo SR M890 being allocated to another service. In lieu of Scania L94UB/Wright Solar 5232 (NK55 OLM) which has now been returned to Chester-le-Street, this vehicle has now transferred to Deptford Depot on temporary loan. 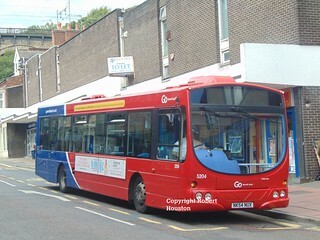 This vehicle has received the tagline "It's our fantastic people - all 2000 of them - that make the wheels on our buses go round and round"
Following the recent withdrawal of Scania L94UB/Wright Solar 4934 (Y934 ERG); this vehicle has now been fitted with free customer Wi-Fi, and should, alongside similar 5201 (NK54 NUU) and 5202 (NK54 NUV), be allocated to the DU2 service when it runs. 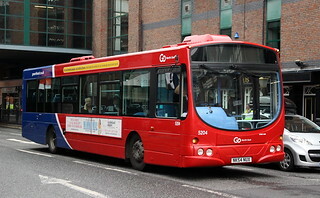 Following the entry into service of the refurbished Mercedes Citaros on "Wear Xpress" service X5, this vehicle has transferred from Deptford Depot to Chester-le-Street. 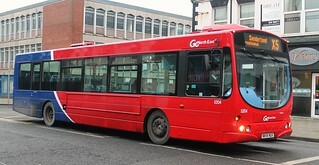 From Sunday 19th March 2017; Go North East will introduce an improved 30-minute frequency to service 13 on Monday to Saturday daytimes, and it will interwork with services 14 and X25. 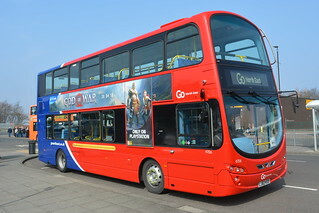 The revised PVR will be 10, and 8 of the vehicles allocated will be single-deck Scania L94UB/Wright Solar vehicles, which are more reliable and will reduce fuel and maintenance costs. 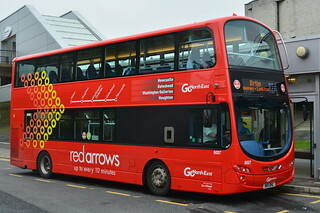 Following repaint, this vehicle has gained "Fast Cats" branding, without route details above the windows. 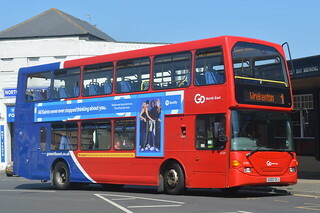 Having previously carried "Prince Bishops" branding, this vehicle has been repainted into a plain black base livery.